This workplace diversity questionnaire is ideal for keeping your workplace inclusive and up-to-date with the latest diversity guidelines. This voluntary and anonymous survey will help measure diversity in your workplace and ensure that employees feel safe and included. 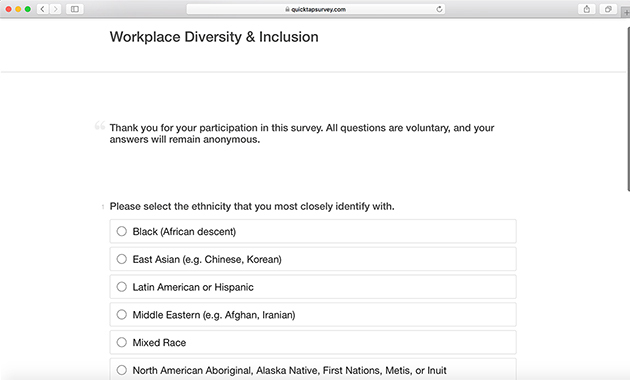 A diversity survey is an online survey that can be completed by employees at a workplace anonymously. The survey gauges how diverse your workplace is and also explores ways to make the workplace more diverse. This survey asks a variety of questions that spread across many factors of diversity. Do you identify with a disability? This survey is anonymous to protect the privacy of employees but still provides leadership with a holistic view of diversity around the firm. Diversity is a vital part of workplace success. The more diverse a team is the more perspectives and experience is considered when making decisions, which typically produces better results. This survey also ensures that employees feel comfortable, safe, and included at work and asks for suggestions as to how leadership can make the workplace more inclusive. Using QuickTapSurvey is an excellent way to conduct a survey. 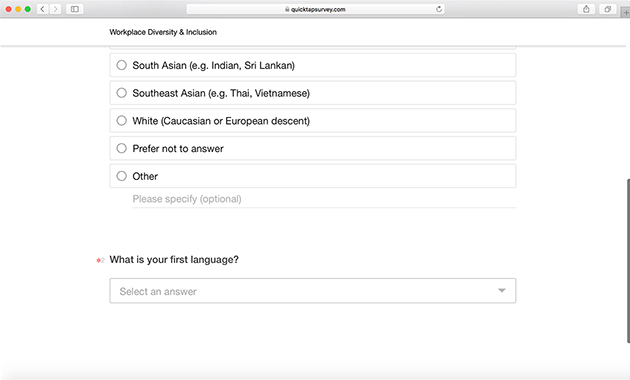 The simple interface allows you to select and customize this diversity survey template. Since this is an online template, it can easily be distributed to employees via email. Viewing results from the survey is also easy since QuickTapSurvey automatically generates reports on the platform. Alternatively, a Microsoft Excel spreadsheet can be downloaded automatically showing the results. Overall the QuickTapSurvey platform allows leadership to easily deploy a workplace diversity survey and make actionable changes based on the results. Start your free trial today and gain access to our templates through the QuickTapSurvey app.